Check out our interview with the author behind the V.C. 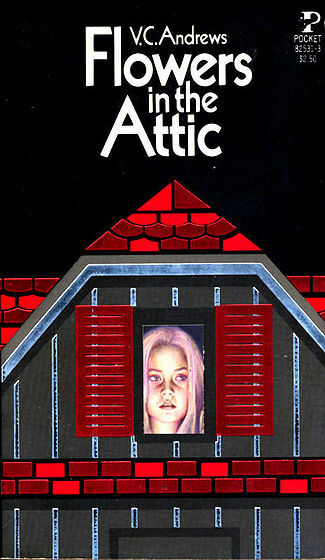 Andrews book series, which has sold over more than 100 MILLION copies worldwide, and spawned such classic moves as FLOWERS IN THE ATTIC. Just Click our pic to listen! One of the most popular authors of all time, V.C. Andrews has been a bestselling phenomenon since the publication of her spellbinding classic Flowers in the Attic. That blockbuster novel began her first family saga, which includes Petals on the Wind, If There Be Thorns, Seeds of Yesterday, and Garden of Shadows. Since then, readers have been captivated by more than fifty novels in V.C. Andrews’ bestselling series. V.C. Andrews’ novels have sold more than one hundred million copies and have been translated into sixteen foreign languages. Sage’s Eyes has just been released and is available everywhere. Following the death of Virginia Andrews in 1986, the Andrews family worked with a carefully selected writer to organize and complete Virginia Andrews’s stories and to create additional novels. The identity of this writer was kept a secret from the general public for years, but the ghostwriter has since been identified as horror novelist Andrew Neiderman, beginning with the completion of Garden of Shadows and the later novels of the Casteel series. Neiderman has carried the VC Andrews torch, satisfying her devoted readers for many years, as well as writing dozens of other novels, which include DEFICIENCY, Unholy Birth, Life Sentence, Deadly Verdict, Garden of the Dead and THE DEVIL’S ADVOCATE, which was made into a major film starring Keanu Reeves, Charlise Theron, and Al Pacino. He also wrote the screenplays for Rain, based on the VC Andrews novels, and Duplicates. Andrew Neiderman’s latest novel, Lost in His Eyes, is also available now. Also, if you enjoy things that go bump in the night, be sure to check out our radio show, Thorne & Cross: Haunted Nights LIVE!, a weekly one-hour horror and thriller-themed show that has featured such guests as Laurell K. Hamilton, Charlaine Harris, Christopher Rice, Cheslea Quinn Yarbro, V.C. Andrews, Christopher Moore, Douglas Clegg, Jay Bonansinga, and many more. Visit the Guest Page to catch one of your favorite authors. Sage’s Eyes, V. C. Andrews’ newest thriller, has just arrived in bookstores and we’ll be celebrating the release on Thorne & Cross: Haunted Nights LIVE! today, January 29, at 5 pm Pacific, 6 Mountain, 7 Central, and 8 Eastern. From Flowers in the Attic to Sage’s Eyes, V.C. Andrews books have thrilled millions of readers. Come listen and see what it’s all about. The link will be available on Facebook at showtime. THE WITCHES OF RAVENCREST: GRAVE EXPECTATIONS, Available Next Week! GRAVE EXPECTATIONS, the first installment in THE WITCHES OF RAVENCREST, book two of the RAVENCREST SAGA, will be available next week. THE GHOSTS OF RAVENCREST, book one in the RAVENCREST SAGA, is available on AMAZON. —Jay Bonansinga, the New York Times bestselling author of The Walking Dead: Invasion, Lucid, and Self Storage. Pinhead and Peter Atkins Raise Some Hell at Thorne & Cross: Haunted Nights LIVE! Thursday at Thorne​ & Cross: Haunted Nights LIVE!, we’re talking to Peter Atkins, author of MORNINGSTAR, MOONTOWN and the screenplays HELLRAISER II, HELLRAISER III, HELLRAISER IV, and WISHMASTER. Pinhead doesn’t want you to miss this show. Just look at him. He’s very excited that you’re coming. Such a sweet little guy. Coming this spring: MOTHER – a new novel by Thorne & Cross. Nothing escapes Prissy’s watchful eye, nothing that is, except her son, who committed suicide many years ago, and her daughter, Claire, who left home more than a decade past and hasn’t spoken to her since. But now, Priscilla’s daughter and son-in-law have fallen on hard times. Expecting their first child, the couple is forced to move back … And Prissy is there to welcome them home with open arms … and to reclaim her broken family.